Amazon drops Kindle 2‘s price to $189 in response to B&N’s Nook drop. The e-book market competition is heating up! 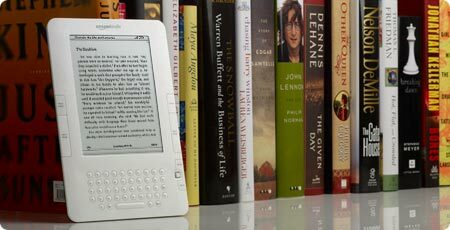 Avid book reader’s are Amazon’s niche – attempting to compare to an Apple iPad is ridiculous. Try taking that heft outside in the direct sunshine while laying back in a lounger and read a book with one …hand while holding a Corona in the other. The Kindle2 battery life is an awesome thing as well and the fact that I can email native PDF format to my kindle email address without having to connect the USB is priceless. Those long, boring work documents that you have to read? Just E-mail them to your Kindle and sip lemonade on the patio while you peruse it! Then add Amazon’s digital library to the package–any book you actually purchased from Amazon is stored and if your Kindle ever comes up missing you can re-send to your new one or any other Kindle associated with your Amazon account (I have 2). There is only ONE thing missing with this awesome book reader and that is the ability to share a book with a friend (purchased books–you can find many free e-books that you can manually download). B&N offers a form of this but if Amazon will respond to that point I think the margin between the two would be huge. Check price and purchase an Amazon Kindle! !